Sorry for neglecting the blog. Seems the busier I am doing fun things that would be interesting to write about, the less time I have to write about them. I also signed up for the alternative work week schedule at work, in which you work 9 hours Monday through Thursday, then get half-day Fridays. Seemed awesome, right? I thought it would give me more time to write and blog and run errands and do the things I like to do. But so far I've only been able to actually leave at noon once. That one time was glorious, though. Does anyone else work alternative work schedules? Have you had better luck at sticking to your schedule without seeming like you are a slacker? Like any good city dweller, I love brunch. But it can be such an over-priced yuppie endeavor, can't it? 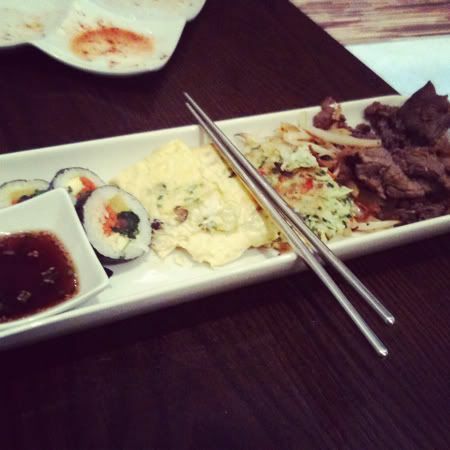 When I read about the brunch plate at Mandu, a Korean restaurant on K Street at City Vista, and I thought it would be fun to try a departure from the usual waffles, eggs benedict, what have you. $12 gets you Mandu's set brunch plate: gimbap, a Korean omelet, chive pancakes, Korean-style hash browns and marinated meat or veggies and tofu. That's a lot of food. Plus it comes with dessert. All this, and gelato too? Posted in Food, DC and tagged with Mandu. February 9, 2012 by Adele Chapin.